Ah, mashed potatoes. The very thought of the creamy, light, buttery mounds of white bring up found memories of Thanksgiving, Christmas and Sunday night dinners. Giving us the cozy comfort only rivaled by a feather duvet, mashed potatoes are the traditional side dish that seem to round out every meal. So why would I be trying to find a replacement for a seemingly perfect food? Well, there are a couple reasons: my right knee is one reason and my left knee is the other. Potatoes (not sweet potatoes), tomatoes, eggplants and peppers (just to name a common few) are part of the Solanaceae family, also called Nightshades, a group of plants named for their ability to grow at night. Nightshades vegetables contain high levels of glycoalkaloids, compounds known to be toxic at certain levels, causing gastrointestinal inflammation, nausea, diarrhea, dizziness, and other symptoms severe enough to require hospitalization. And as for my knees, they’ve been borderline arthritic for years now (don’t ask) and cutting back on all nightshades, but specifically, potatoes has seemed to help. What’s the connection? Glycoalkaloids like the solanine found in potatoes, not only exacerbate inflammatory conditions, but also can disrupt the metabolization of calcium in the body, by blocking its assimilation and therefore depleting already low calcium levels in people with arthritis. Nightshade vegetables may also aggravate other conditions like eczema, cystitis, lupus and psoriasis. It can take up to six months of exclusion of nightshades from the diet to achieve a beneficial effect. Surprisingly, tobacco is included in the nightshade family, and consequently all nightshades contain very small amounts of nicotine, explaining why these foods are so addictive. Some programs to help people give up cigarettes also recommend giving up nightshade foods in order to completely eliminate low level nicotine intake and consequent re-addiction. 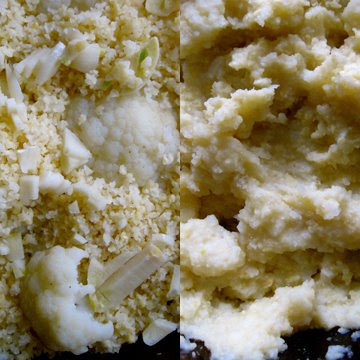 Here is a recipe for mashed potatoes minus the potatoes! This is a great dish to serve even if you’re not trying to avoid nightshade vegetables. The main ingredient is millet, a nutty, quick-cooking grain similar to quinoa, only slightly drier. Millet can be used in place of rice, or any other grain. 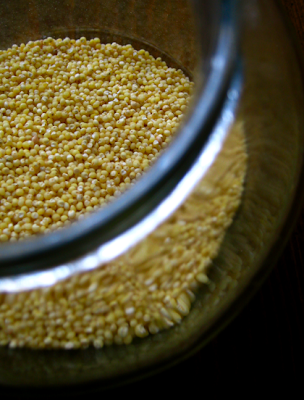 Aside from quinoa and amaranth, millet has the most complete protein of any grain, making it a great choice for vegetarians. It is naturally alkaline, which is beneficial to the spleen, pancreas and stomach. Its significant amounts of iron, lecithin and choline help keep cholesterol in check and stop the formation of certain types of gallstones. 1. Rinse millet well by covering with water and swishing it around, then draining. Do this 2-4 times until the water runs clear. 2. 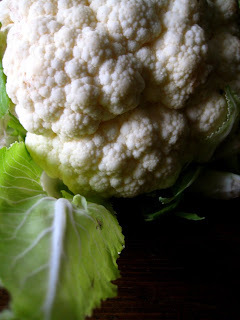 Chop cauliflower and onion into chunks. 3. Put rinsed millet and water in a large pot and cover with chopped vegetables and salt. Bring to a rapid boil, cover and simmer for 20-30 minutes, until the vegetables are soft and the millet is cooked. 4. Remove from heat, add the cold pressed oil (and arame is you’re using it), and mash with a large fork or potato masher. For an extra smooth consistency, use a hand blender or a food processor. Millet is like a blank canvas – you can use any type of vegetable you and your family likes. For orange mash, use carrots; for green use broccoli, kale, or spinach; for pink use beets! info source: Balch, Phyllis, A. Prescription for Dietary Wellness. New York, NY: Avery, 2003. Hi, I’m using this recipe since a few months. Really like it ! However one problem: the millet always seems to burn on the bottom of the cooking pot. Do you, or anyone, have some advice to avoid this? Anyway thanks for all the nice recipes on your blog. To avoid burning, use a high-quality saucepan that has a heavy bottom (copper-lined is ideal). Also, after bringing to boil, put on lowest flame for the remainder of cooking time. **I, first, bring my millet and liquid to boil on a larger stove element, but then switch over to the smallest burner element on the stove and put it on the lowest flame possible. This will avoid burning. Made this just a second ago, I added some wholegrain mustard on top and it definitely gave it that extra punch 🙂 delishh! On another note, just discovered your blog and am loving going through your recipes! Will definitely try some when I go on my vegan spree this year! Thanks for the recipe, Sarah. It is a nice blank slate. I spiced my mash with wasabi and caramelized leeks… and served it with pan-fried king oyster mushrooms in a coconut-tamarind sauce. Delicious! Well this recipe passed the ultimate test… my Irish boyfriend who only eats mashed potatoes ate a ton and said he really liked it! And could even see himself cutting out the unhealthy mashed potatoes that we used to make! i did do something different though… we love the buttery taste of traditional mash, so I used ghee in place of the olive oil. I’m not sure of the nutritional value of ghee, so do you think that was a good idea? It tasted amazing, that’s for sure. No, the flavour isn’t really “mashed potato-y”, but I really like it anyway 🙂 Glad you do too! When I use my immersion blender, it all gets pretty fully and airy. You can also try a food processor – it’s just more clean up! Didn’t really taste like potatoes (sort of sweet and nutty) but very delicious. Especially with a twist of pepper and a squeeze of lemon. Yummmm. Do you have any tips for making it fluffy? Maybe spin in the mixer? I like your alternative way of thinking and have just bookmarked the millet mash.